'The Film One' is very nearly ready! Against all odds (my mac died the death of a thousand spinning wheels) and my better judgement (the last one was much more work than I had hoped) it should be available in your local newsagents by mid April. By which I mean it will be available from my online shop and a few other zine friendly outlets. It's going to print next week and I will start screen-printing the covers soon after. For now I bring you my editorial illustration to Paul Bareham's written submission for 'The Satanic Rites of Dracula' as a taster. Before anyone suggests that the gun is a little on the small side and that I fail at perspective I've been informed it is in fact a Derringer pistol - which my research suggests is a small child's firearm. 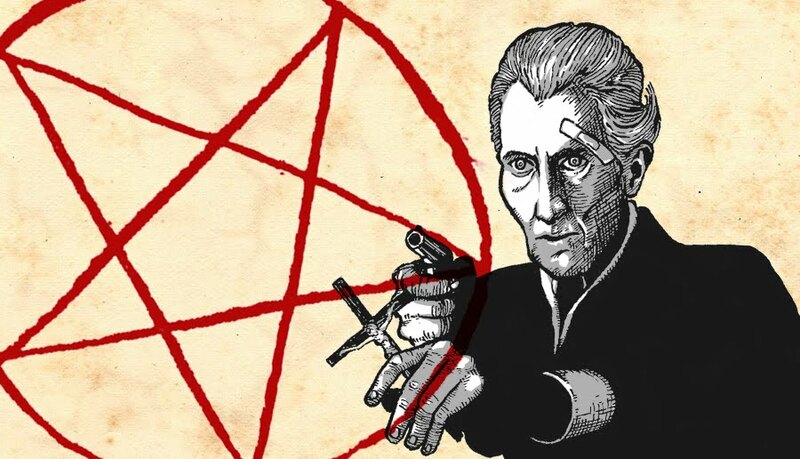 Also I could do with practicing my pentangles a bit more - mine's on the piss - my misspent youth featured all manner of silly nonsense but unfortunately not as much devil worship as perhaps I would've liked. Click on the image to see it as if it were closer to your face.